The tuition fee varies according to the government funded or private colleges. The average fees ranges around Rs. 35,000 pa in government aided colleges to around Rs. 2 Lakhs pa. However, AIIMS is one such institute with the fee structure as low as around Rs. 6000.
Who should opt for MBBS course? Students who have a keen interest in learning the basics of human body, its workings and also the diagnosis of diseases and their cures, should opt for this course. This course has a structure which develops a person’s psyche towards the feelings of service and ailment of the sufferers of various diseases. The students, after doing this course, also become an active participant in community as they are always ready to help the ones in need through their medical practices. Any student who wishes to have a career in the medical field, be it a surgeon, a medical director, a specialist like a gynecologist or an anesthetist etc. should consider this as the best field of study because this gives an introduction to all the discourses in detail. The complete duration of the course is five and a half years which includes a rotating internship of one year. The course is usually divided into 9 semesters of 6 months each. Apart from the regular courses the students are also supposed to participate in hands-on training in the wards and out-patient departments. This provides the student with real life experiences in practicing and performing clinical procedures integral to their further practice as a doctor. Usually, the minimum eligibility for the course is 10+2 with subjects with a minimum of 50% marks in Physics, Chemistry and Biology. English is also a mandatory subject for eligibility in many of the universities and colleges. However, AIIMS requires an aggregate of 60% for the general category candidates and 50% for SC/ST candidates. Also, along with these prerequisites, certain universities like Banaras Hindu University, Varanasi limits the age of the candidates ranging between 17 and 25. While, on the other hand, AIIMS has set the lower limit to be 17 years of age for any candidate to apply for the course. The basic eligibility for admission in any of the Medical Colleges is 10+2 with 50% marks in Physics, Chemistry and Biology along with English. However, this is not the only criteria for admission; the students have to take an entrance exam in order to prove themselves fit for the admission in any of the medical colleges. The major entrance exams are AIIMS Entrance Exam and NEET Exam. Usually the forms for the entrance exams are available online. The forms for AIIMS are available in the last week of January and the entrance exam usually takes place in the last week of May. Similarly, other entrance exams also take place in the months of May-June after the result of 10+2 is declared. Once the result for the entrance exam is declared, the students are called for counseling based on the merit prepared considering both the marks obtained in the entrance exam and the qualifying (10+2) exam. The mode of testing is an objective type test, testing the basic knowledge of a candidate based on the subjects studied in 10+1 and 10+2 from CBSE, NCERT and COBSE along with various state syllabi. The main aim and objective of the entrance test is to evaluate the basic knowledge and aptitude of the candidates taking up the prestigious course of MBBS. The colleges who offer this course assume that the students enrolled have a pre-knowledge of the fundamentals of the courses taught. Along with these modes of admission to MBBS, there is also a provision for direct admission to around 30 Medical colleges all over India through Management Quota seats. Currently, only Indira Gandhi Institute of Medical Sciences, Patna provides a correspondence course in MBBS. As per the Medical Council of India, the course spans for 9 semesters that is, four and a half year followed by a mandatory internship of one year. The syllabus is divided as Pre-clinical, which covers mainly the first two semesters of the course focusing on the basic knowledge of various subjects like anatomy, physiology etc. The second phase is the Para-Clinical which spans for three semesters (one and a half years), focuses on the teaching of subjects like forensic medicine, pathology etc along with the essential aspect of the course- Community Medicine. The third phase is the Clinical phase which focuses on practical knowledge and practice along with subjects like psychiatry, pediatrics etc. Understanding the use of anesthesia; to encourage the student to work effectively as a community physician, diagnose and manage common skin diseases; acquire skills for a general practitioner; understanding the common problems of the eye, the musculo-skeletal system, ear, nose and throat problems and the development of children etc. Medicine and Surgery is one such field which is always in demand. Once graduated from a reputed college with an internship completed, one gets the opportunity to either work with a hospital as a practicing doctor or could start their own individual clinics. One can either work as a general physician or pursue a specialization and work in that field. The other career options include the profiles of medical officer, admin coordinators, internist, physician and sectors like clinical research. The job profile of a medical superintendent or a medical director (MD) is also a promising career option after MBBS because it provides a salary package of around 13 lacs. The job profile focuses on providing medical care to the employees who get ill at work. The general physician treats the patients on a very primary level. The consultant has the job of business analysis and management consultancy. The surgeon’s job is to perform surgery. It is a specialized job. A medical superintendent is supposed to supervise the workings in a medical organization. The job of a dietician or a nutritionist includes preparing diet charts for the patients and keeping a track of the same. On an average a general practitioner earns around 5.5 lacs, while a surgeon earns 7.5 lacs. Job profiles like that of specialists like pathologist, pediatrician, gynecologist, orthopedist, cardiologist etc. offer a salary package of around 10 to 12 lacs. 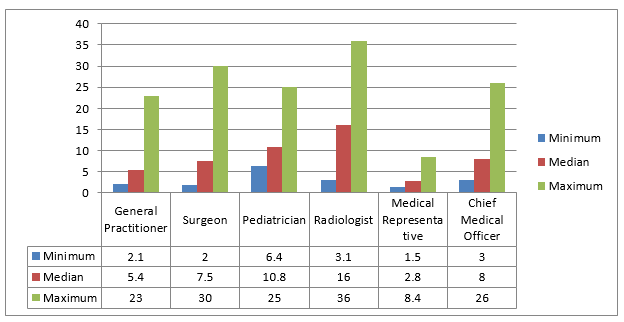 In terms of salary, a radiologist and an anesthetist gets the highest pay scales of around 14.5 to 16 lacs. The job of a medical representative pays around 2 to 5.7 lacs while that of a chief medical officer pays around 8 lacs per annum. There is also a job of a dietician and nutritionist, if someone is interested in the health sector; it pays around 2 lacs to 6 lacs per annum. While, on the other hand, a paramedic earns about 2.2 lacs to 5.3 lacs per annum. 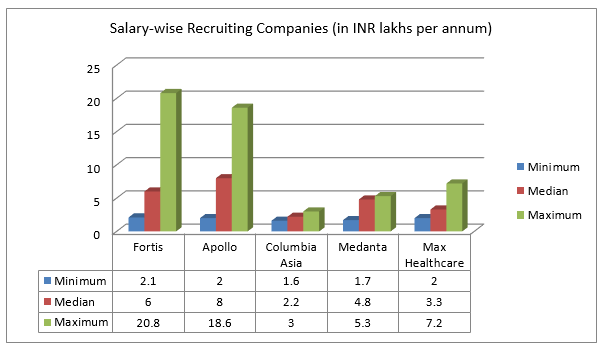 The salary-wise chart shall help the candidates get an overview of the different salaries provided to different job profiles. All the salaries mentioned are annual salaries in INR lakhs.